At first glance, your energy bill might seem overwhelming and confusing. This usually leads to customers either not understanding their bills or avoiding dealing with their energy supplier altogether. Thanks to Ofgem, the energy industry regulator, while bills may have been overly complicated in the past, your supplier should now make your bills relatively easy to understand. 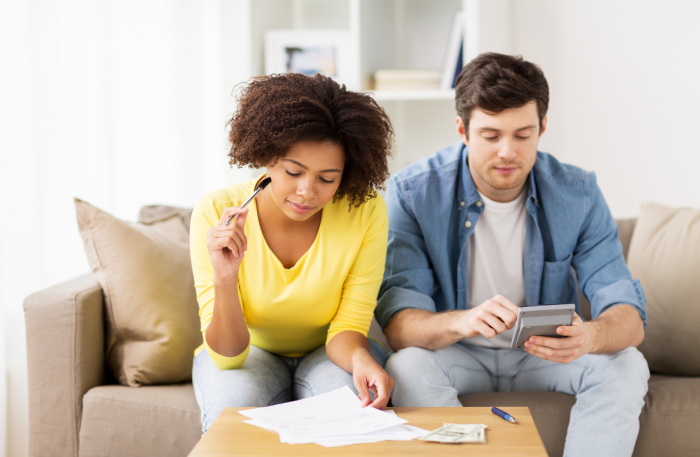 This guide will tell you how to read your First Utility bill, which could also help you understand others when you switch suppliers. 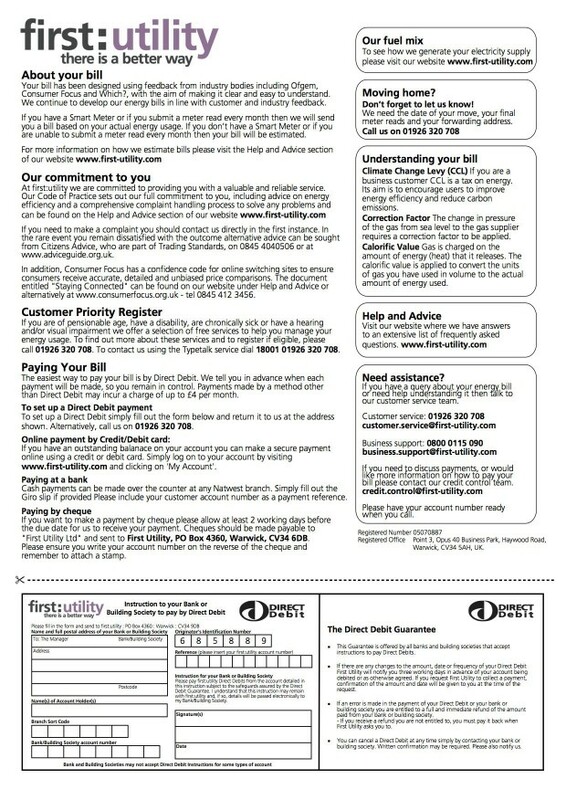 The first page of your First Utility bill contains the essential information for you to check each month. This means regarding how much your bill is if you’re in debit or credit, as well as your essential account information. You should check your bills to make sure you haven’t been over or undercharged for your energy. This can end up with you having a huge unexpected bill as ‘backbilling’ involves your supplier charging you for up to 12 months of bills you underpaid. Your account information is important especially when complaining to your supplier, as it will help the person answering your call locate your account info. Thereby making the process a lot easier and quicker. 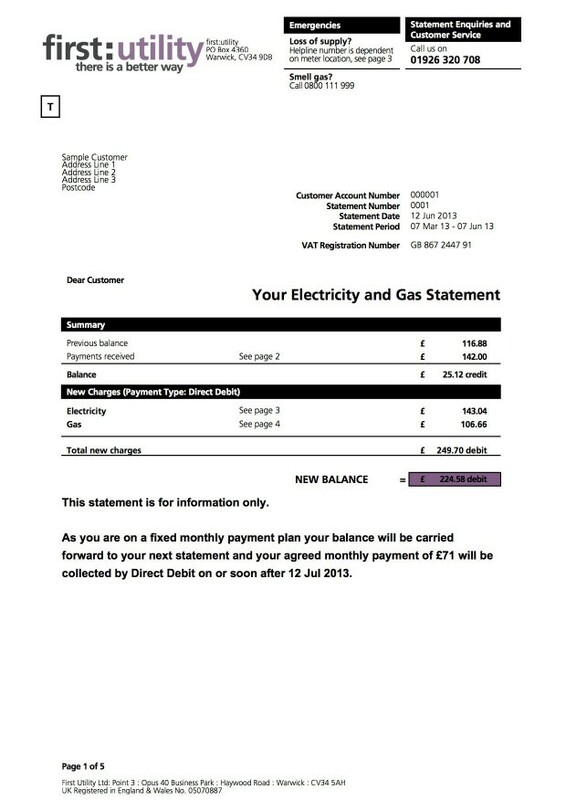 The second page of your First Utility bill contains information regarding your current tariff. 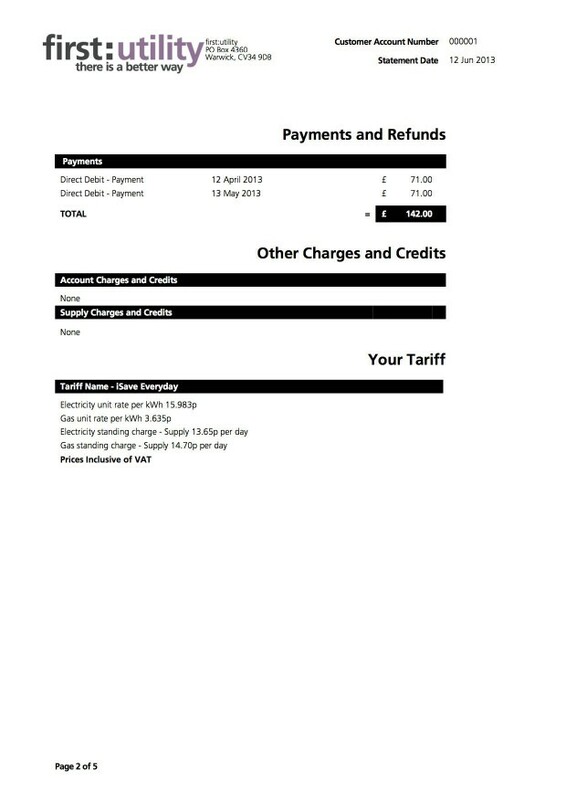 This includes what your tariff is called, the payment method you are using to pay for your energy, your tariff end date, exit fees and standing charges. Payment method: How you pay for your energy. Tariff end date: When your contract ends, if you switch before this you will usually incur a fee. Exit fee: The amount you will have to pay your current supplier if you decide to switch before the contract ends. Standing charges: The cost of your energy when you aren’t at home using it. The bottom of the page will contain information about your energy usage, comparing this year to last year. 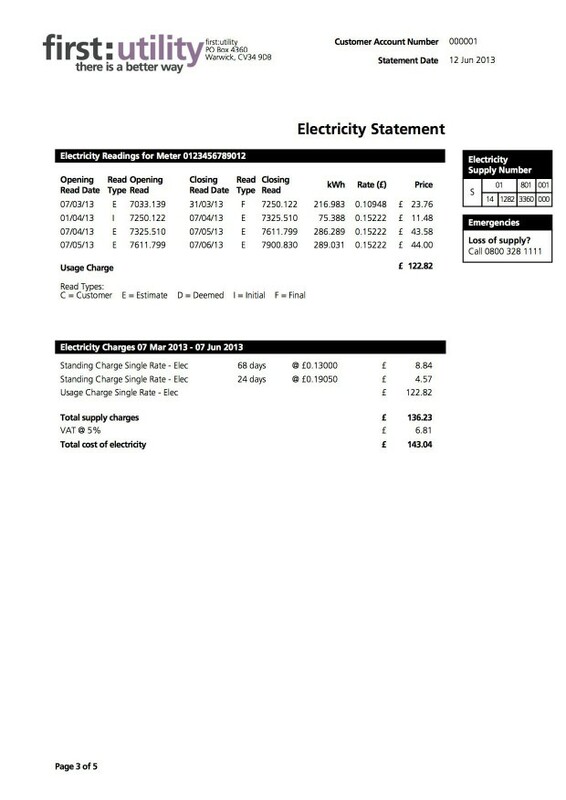 Page three has your electricity statement information. You can see your electricity supply number here. This is a unique reference for the supply that goes to your property. You can also see how much electricity you have used and when. On page four you will find your gas statement. It will tell you how much gas you have used. How they calculate this amount and other essential information about your gas. 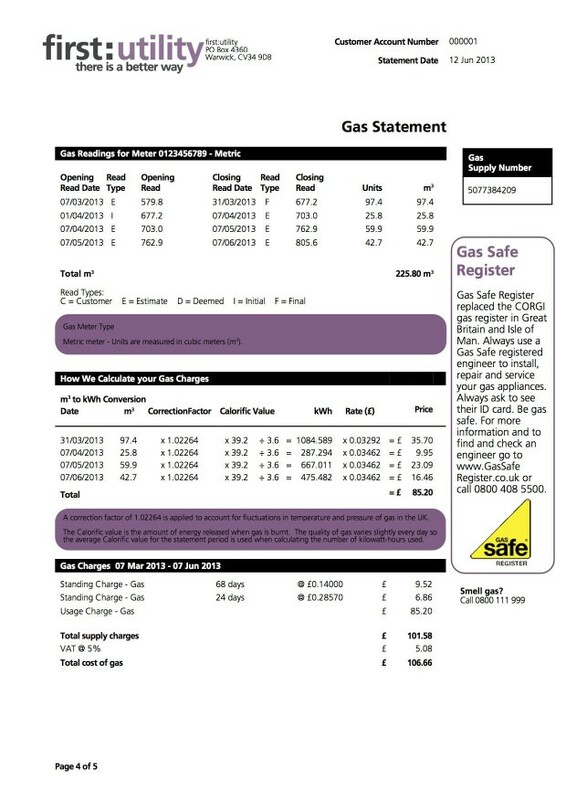 Your gas supply number is the unique reference number for the gas supply that goes to your property. This is based on meter readings which you supply the company with. Or estimations First Utility has made based on your previous usage. The final page of your bill includes information that may not immediately seem overly helpful, but in certain situations, you may want to keep a copy. For instance, this page concerns information about how to make a complaint, their Priority Services Register and how to set up payments for your energy. It is always a good idea to file your bills to ensure that you still have documentation.